On Wednesday, March 27, 2019 Larry Wilbert Nipper Sr. made his grand entrance in to heaven at the age of 71. Larry was born on August 11, 1947 in Alderson, WV to George and Sylvia Nipper. After bravely going overseas as a military policeman during the Korean War, Larry returned home to live the American dream of being a family man and entrepreneur. 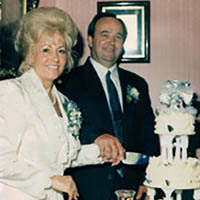 He is preceded by his first wife, Judy Gaye Kiser Nipper, mother to Larry Jr., and survived by his wife of soon to be 49 years, Kathern Peck Nipper, who he raised two sons with, Jason and Justin. Larry loved making music, praising the Lord, and playing with his grandbabies. He saw the country and met wonderful people traveling with his family and band “The Singing Nippers.” It was his honor and blessing to touch the lives of so many with his music ministry both through the band and from owning local gospel station WBLB. Larry was a sociable man who made, and kept, many friends through the years. Quick witted and tender hearted, his legacy will be that of treating all those he met with dignity and respect. Larry is survived by his loving wife, Kathern Nipper, his three beloved sons and their wives, Larry Jr. and Michelle Nipper, Jason and Heather Nipper, Justin and Kate Nipper, the joys of his life, his six grandchildren Brittany, Jordan, Jonah, Georgianna, Gianna, and Charles, his siblings and Shirley Webb, Roger Nipper, Linda Nipper, and Brenda Sutphin. He is preceded by his parents George and Sylvia Nipper and his brothers George Nipper Jr. and Arnold Nipper. A funeral service will take place Sunday March 31, at 5PM at Pulaski Church of God located at 1621 Bob White Blvd, Pulaski, VA 24301. The visitation will be held at the same location on the same date from 3PM to 5PM. A graveside service will be held Monday, April 1, 2019 at 11:00 a.m. at Highland Memory Gardens with military honors.